What is a Bead Graph? 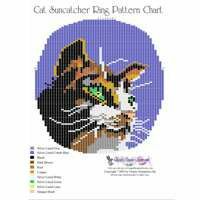 : Beading Patterns and kits by Dragon!, The art of beading. Home About Patterns & Kits What is a Bead Graph? There are no instructions with a Bead Graph. If you want instructions you want a pattern. Bead Graphs are intended for use by those who have an existing pattern that the color charts will work with. Experienced beaders are invited to try these out! A Bead Graph is a picture represented by colored ovals that are the colors of the beads that should be used. The colors are numbered and color coded. The colors are just color coded. Color graph without color numbers. The colors are color coded with some of the colors having lines across the color so they are easier to discern. Color graph without color numbers. The Bead Graphs on this site come in one of those 3 types. 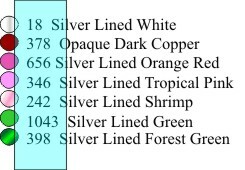 I have to added this note because I so often have people reference the bead colors to these numbers. These numbers do not anything to do with the colors of the beads. The numbers highlighted in this illustration are the amount of beads that are needed for that Pattern or Bead Graph.